According to the New York Times, the first food truck was opened by a Walter Scott in 1872 when he cut windows into a small covered wagon and parked it in front of a local newspaper office in Providence, Rhode Island, and sold sandwiches, coffee and pies to the journalists working late. Once reserved for dirty late night drunken fried food, food trucks have seen a huge resurgence in recent years, and you know they’ve become cool because they’re appearing in movies and TV shows like What To Expect When You’re Expecting (Chase Crawford was possibly the hottest food vendor ever), Chef and even Australia’s own The Bachelor, with its now infamous #DirtyStreetPie. If I owned a food truck, I’d call it Stone Cold Heart, play awesome break up songs and sell ice-cream with names like Don’t Be Sad salted caramel, You Deserve Better strawberry, But I’m Lovely lime and, what I predict to be everyone’s favourite, He Was A Bit Crap in Bed belgium chocolate. In recent years Brisbane residents have embraced food markets of all types and locations; from farmers’ markets which seem to be opening in every second suburb on every second Sunday, to the pop-up, shipping container style Eat Street Markets at Hamilton, PheNomNomNom at Coorparoo Bowls Club and the hugely successful Night Noodle Markets which attracted more than 100,000 foodies in 10 days. 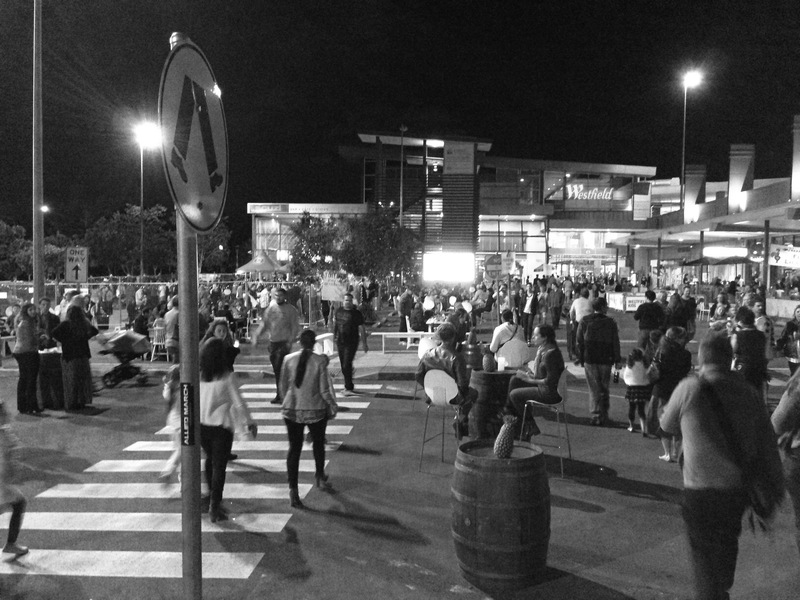 It’s no surprise retail giant Westfield Chermside jumped in on food truck action with last night’s Food Van Jam – a car park party boasting 12 of Brisbane’s best food trucks/pop up stalls, a licensed bar and the Brisbane Broncos game on the big screen. It seemed like the perfect Friday night outing—especially for those who didn’t want to tackle the parking and crowds on Eat Street and with a 4pm kick off it was also touted as a family and pet-friendly event. But with more than 1000 people in attendance, vendors couldn’t keep up with demand leading to long lines, sold out products and early departures, which left some diners with a bad taste. Jenny and I arrived about 7pm and our joy at having quickly nabbed a car park close to the action disappeared when we realised That BBQ Joint was already closed up for the night. There was more bad news to come … Oi! Taco had also run out of food just three hours into the seven hour event. Ol! Taco was totally sold out by 7.30pm. 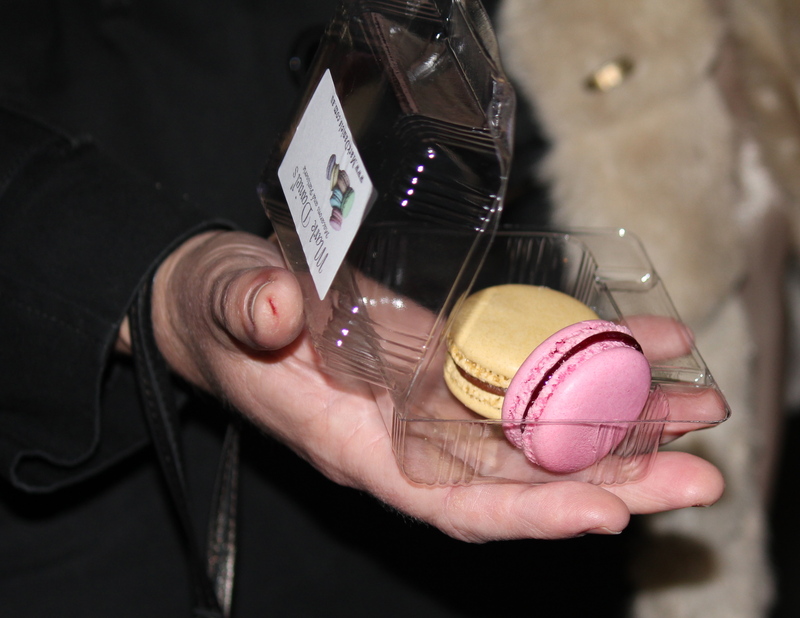 Due to the large lines, we started with dessert—macarons by Mark Daniel Patisserie. Although his macarons have been stocked at a number of venues across Brisbane for the past few years, Mark only branched into hosting a pop-up stall at events and food markets six months ago. “I’m always surprised at the growing popularity of food trucks and markets; it seems there are always new markets and events on each week and they get a large crowd every time,” he said. Often, the hardest decision faced by Mark’s customers is what flavour to choose and Jenny and I struggled too, so we went for the 5 for $10 pack. Twice. “Our most popular flavours are Salted Caramel, Pistachio, Vanilla and White Chocolate and Passionfruit but my favourites would be Turkish Delight, which is a rose-water ganache with a disk of Turkish delight inside, and I also love our Black Forest, which is milk chocolate ganache infused with cherry essence then with lumps of cherry jelly mixed through it,” he said. The salted caramel was amazing, but the raspberry was my favourite. Mouth-watering macarons by Mark Daniel’s Pâtisserie. Also doing a roaring trade was former courier driver Steven Thomas and his wife Debra who were inspired to open their own food van—Thumbs Up Hotdogs—after a trip to the USA. “We liked what we saw and thought nobody back home is doing this so we started with lots and lots of research and testing to come up with the same kind of offering as the street venders in the USA,” Steven said. 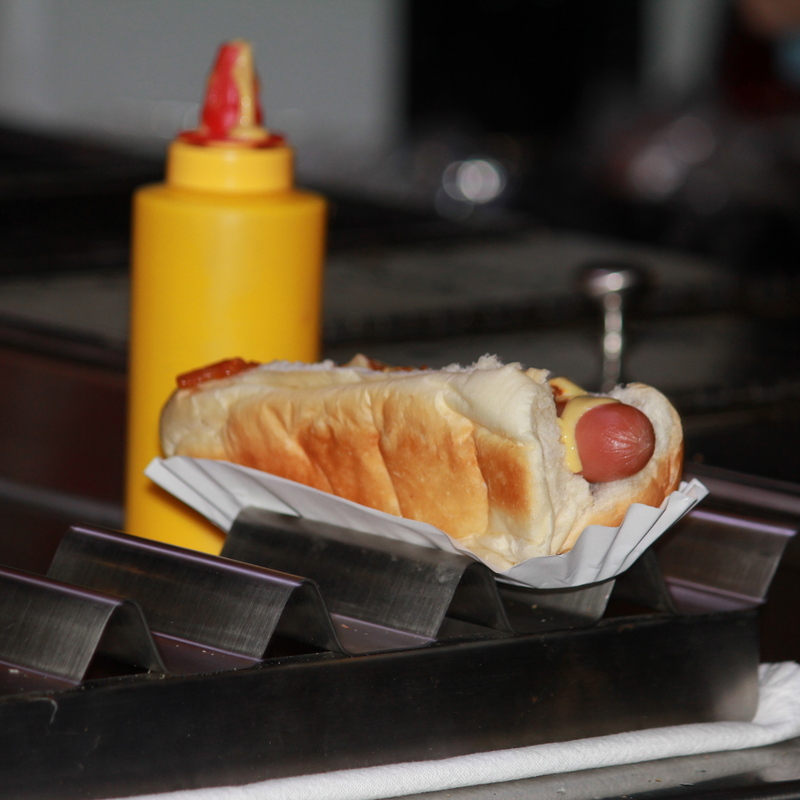 To give their business an ‘authentic’ feel, the couple imported a genuine New York hot dog cart. “It is the only one of its type in Australia so we are not such a food van but a street cart but our truck serves as a support vehicle,” he said. The couple are now regulars at markets around Brisbane and are so popular, they were selling 100 hotdogs an hour when they appeared at the first Phennomnomnom event at Coorparoo Bowls Club in June. 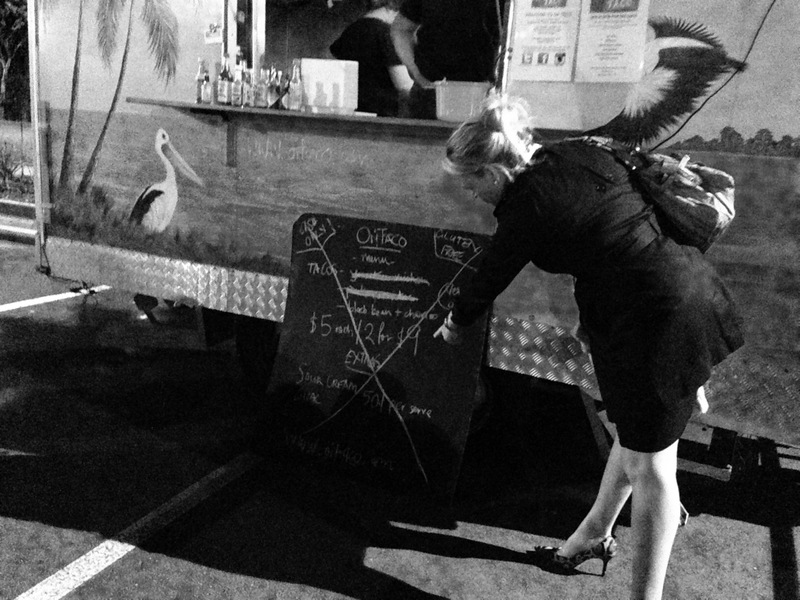 In the end, after I persuaded Jenny not to go to Grill’d, we joined the line for Fiery Deli—a Gold Coast based food truck run by Eric, Trish and Kevin Perez, which offers up gluten, dairy, yeast, refined sugar and caffeine free food with a Venezuelan twist. “For us, it was about sharing with people who we love food that we eat, as well as showing people that eating well doesn’t have to be about missing out at all,” Trish said. And we waited. And waited. And waited some more. It took 45 minutes for us to reach the top of the line where we ordered two sets of Fiery Deli’s signature nachos (shredded chicken and shredded beef) and 15 minutes later we got our meals. But we couldn’t fault the trio who were run off their feet trying to keep up with demand, serving close to a meal a minute. 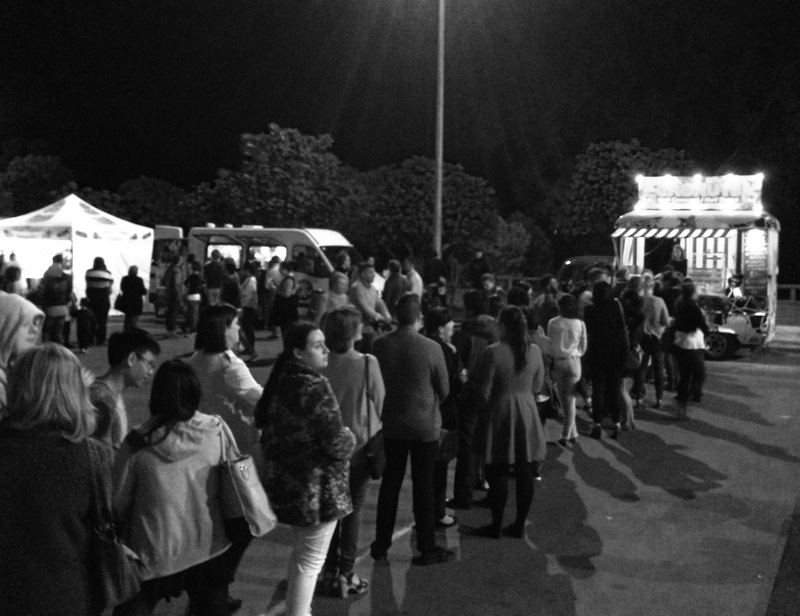 It also seemed that as each food truck around them began to run low on food, their line—and the lines at King of the Wings and Thumbs Up Hotdogs—grew longer. The line for King of the Wings was still more than 50 people long at 9pm. With our nachos in hand, we made our way over to the cool shared seating which had been set up and shivered our way through our meals. 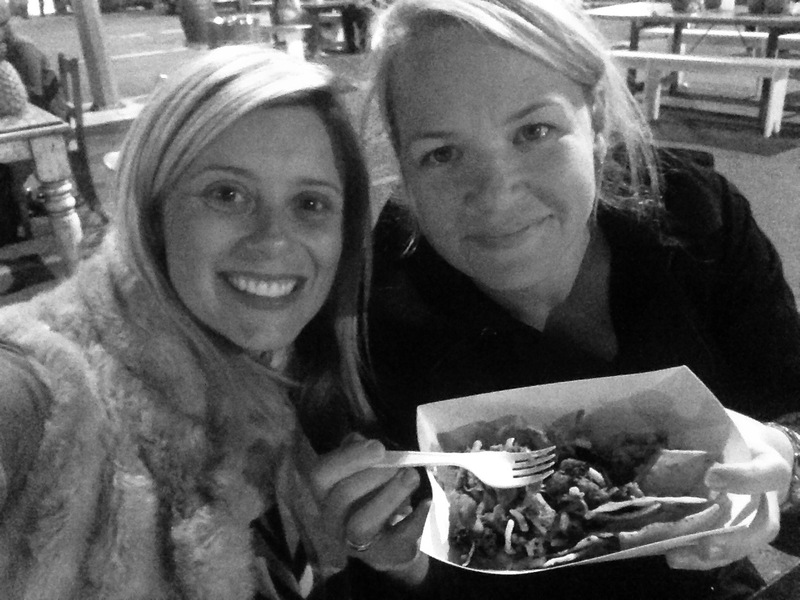 While my grand plans of eating my way around the markets—sharing with Jenny, of course—were scuttled, there’s always more markets to visit and food trucks to check out. Sure there were some hangry (hungry + angry) people around and they’ve been making their feelings known on social media today, but I suspect it’s hard to predict how popular these events will be. I just know that from what I saw during my two hours at Food Van Jam, the vendors were working their butts off to make sure they could feed as many people as possible and I’m sure that if the event is held again in the future … they’ll probably be more prepared for the hungry masses. With our half demolished nachos.